Learn all about bladder cancer sign and symptoms! 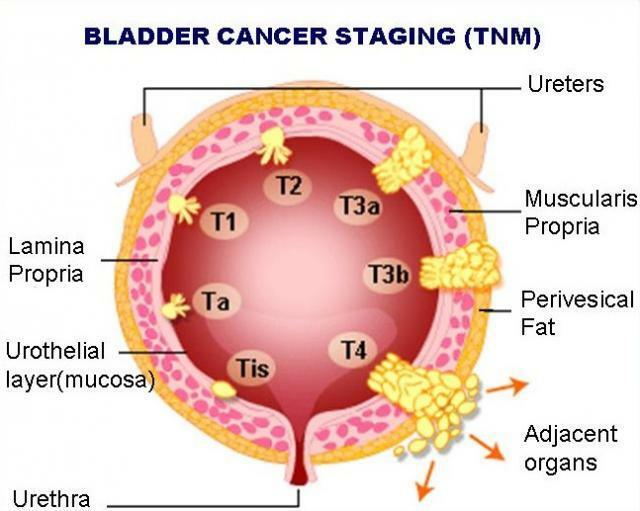 Bladder cancer is a type of cancer that originates from your bladder which is a balloon shaped organ around the pelvic area of the body.It is now recognized that exposure to certain chemicals is the exciting cause of many cases of cancer of the bladder.These chemicals may be taken int other body by various routes but are eventually eliminated through the urinary system and thus appear in the urine as it is stored in the bladder. It was noted earlier that cancer of the bladder may be often caused by the use of cigarettes because certain irritating substances in tobacco smoke are eliminated from the body through the urinary system. Presumably these chemical substances serve as irritants to the tissues of the bladder. The earliest significant sign of cancer of the bladder is blood in the urine, often unaccompanied by pain.Whenever this occurs, a prompt examination of the urinary system should be made to determine the cause of this bleeding. In some cases a growth somewhat like seaweeds develops within the bladder, and this may float over the outlet of the bladder to interfere with the flow of urine when the bladder is being emptied. This circumstance also deserves prompt attention by the physician. Treatment of cancer of the bladder by surgery or by a combination of surgery and irradiation is relatively successful if the cancer is detected in its early stages. Presence of blood in urine is termed as hematuria which primary warning sign of bladder cancer.Urine color may or may not be change depending upon quantity of blood present in the urine. Hematuria is the early symptom of bladder cancer in association with or without pain.Blood in the urine does not always mean you have bladder cancer. Almost every type of cancer is strongly associated with body pain and tenderness.Most common cause of body pain is pressure exerted by tumor growth to adjacent tissues. In case of bladder cancer pain in pelvic area will be more prominent than any other region.